Review Summary: Watch it only if you want to see what old-fashioned Bollywood looked like before the smart new wave swept away the cobwebs. 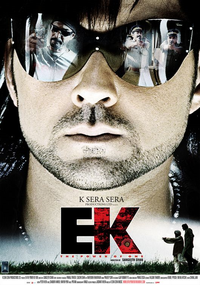 Ek-The Power of One takes you back to the cinema of yore. Watch it only if you want to see what old-fashioned Bollywood looked like before the smart new wave swept away the cobwebs. Ek, a remake of Telegu blockbuster Athadu, is the kind of high decibel, low IQ film that makes you feel like you’ve been bludgeoned in a dark alley. It’s ugly, gratuitously violent and morally specious. And just when you think it can’t get worse, it does. Ek: The Power of One is a remake of the Telugu film, Athadu, starring Mahesh Babu [Images] and Prakash Raj [Images].